Crystal Hana Kim’s debut novel If You Leave Me was named a best book of 2018 by The Washington Post, ALA Booklist, Literary Hub, Cosmopolitan, and others. It was also longlisted for the Center for Fiction Novel Prize. 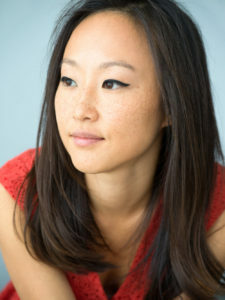 Kim was a 2017 PEN America Dau Short Story Prize winner and has received scholarships from the Bread Loaf Writers’ Conference, Hedgebrook, and Jentel, among others. Her work has been published in Elle Magazine, The Paris Review, The Washington Post, and elsewhere. She holds an MFA in Creative Writing from Columbia University and an MSEd from Hunter College. She is a Teach For America alum and has taught elementary school, high school, and collegiate writing. She is currently the Director of Writing Instruction for Leadership Enterprise for a Diverse America and a contributing editor at Apogee Journal.